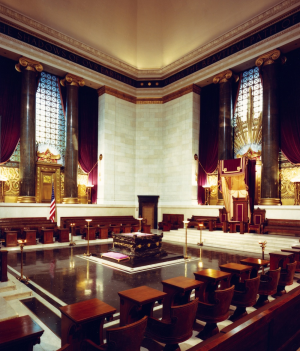 The Scottish Rite of Freemasonry was organized in the United States in 1801 and traces its lineage to Masons in 18th century France as well as to Frederick the Great of Prussia. Scottish Rite bodies are located on every continent and share the common values and goals of helping men become better individuals, husbands, fathers, and citizens of their respective countries. As indicated by our name, the Scottish Rite is a part of the Masonic Fraternity, advancing the principles of Freemasonry through the ritualistic teachings of the 4th through the 32nd degrees. As Freemasons and as Scottish Rite Masons, we hold the philosophical and practiced principles of brotherhood, equality, religious toleration, political freedom, and charity as important guiding principles in our lives and conduct. Through a sustained application of these moral and philosophical tenets we strive to function as a University of Freemasonry advancing a Master Mason's journey of seeking more light. This lifelong pursuit of knowledge and personal enlightenment helps us to become better men. The Scottish Rite as expressed in its Degrees with their accompanying lectures and instructions, is an advanced course in Freemasonry. It is indeed a liberal education. It is a lesson in geography. Almost every country of Europe is visited in the dramatic presentations of Masonic history and tradition. Biblical lands appear frequently in fast moving panorama of scenes and events. Africa, too, shares the spotlight. Travel, they say in itself, constitutes an education. Then here is the beginning of it, at least. It is a course in history. Modern times and life, of course, are represented. But medieval chivalry makes its stately and courteous bows, and gives a romantic and worldly atmosphere to the picture. Biblical events and scenes are often portrayed. There is even a rather startling page from ancient Egypt, taken from the oldest book in the world, the Book of the Dead. It is a bird's eye view of philosophy. The great thoughts of the greatest thinkers of all time are expressed, profound principles in the simplest of words, sometimes in symbols that convey a depth of meaning, and sometimes in dramatic form, most impressive. And through it all runs the saving grace of sound common sense, and in the end it is the spirit of man that rises above the material in him and in the world about him, and stands forth as the one thing of earth that is of divine dignity and infinite worth. It is an excursion into the mystic realm of religion not to find cause for criticism or condemnation, but to seek the common ground of all faiths, the deepest thought and aspiration of all who believe in and search for the great creating God, who is the Father of all His human children. However much men may differ in the way in which they may clothe their God with qualities and attributes of their own making and choosing, they all think together of the one God of infinite wisdom and love, who has breathed into man something of His own spirit and made him capable of entering into and enjoying the life which is immortal. Tolerance thus becomes sympathetic appreciation and not mere endurance of differences of opinion. It is, not to prolong the list, a practical course in ethics, or, perhaps better, a course in practical ethics and morals. Life is seen and viewed and approached and lived and judged from the moral or ethical point of view. Life's ills and inequalities and injustices are seen and weighed with sole reference to their moral quality, their spiritual value. Social and industrial and political and ecclesiastical evils, and other exhibits of human weakness are dramatically exposed and condemned. A new and better world rises before the awakened imagination a world in which every man becomes a real brother, and the new law, the Law of Love, begins its reign on earth. It is indeed an excursion into life, especially life as it may be and will become, if we will but take to heart the high principles and profound ideals which the Scottish Rite Degrees so beautifully and effectively present. The Scottish Rite is based upon Blue Lodge (or Craft) Freemasonry and in this country it does not confer the first three degrees. This is recognized as the unquestioned prerogative of the Grand Lodge in each state. The Scottish Rite confers the degrees from the fourth to the thirty-third inclusive. Many questions raised by the Blue Lodge Masons, but left unanswered, are answered in the Scottish Rite. Largely, it bears the same relation to Craft Masonry that the University does to earlier grades in education. At all times it recognizes the supreme authority in Masonry of the Grand Lodge and the Grand Master. It teaches that there is no rank higher than that of Master Mason, and no Masonic symbol more significant than the Master's Apron, but it elaborates and emphasizes the great principles enshrined in Craft Masonry. When a Master Mason advances to the higher degrees of the Rite, it does not detract but adds to his interest in everything for which the Blue Lodge stands. It deepens his appreciation of it, and motivates him to more active participation in its affairs. He cannot fail to see the intimate relation between the two, and far from losing interest or diminishing his appreciation, he actually gains in both, or should. The Scottish Rite aids, supplements and reinforces the Blue Lodge in every way. As organizations these bodies are mutually dependent and strengthen each other with reciprocity. The Scottish Rite is a rite of enlightenment. Its purpose is to spread the light of Masonic truth by revealing and explaining matters concealed or only hinted at in Craft Masonry. 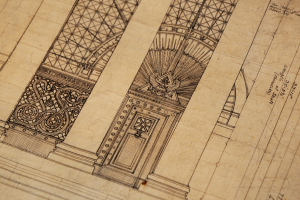 Knowledge is power and the Scottish Rite seeks to arm its votaries with moral and spiritual understanding. Scottish Rite Freemasonry challenges no man's political creed, leaving that to his country and himself; it does not interfere with any man's religious opinion, leaving that a matter between his God and his conscience, and yet it does seek to impress by most sublime and beautiful lessons, enforced by the most profound reasoning the almighty power of truth, appealing to the highest and purest sentiments of the human soul for the enforcement of its principles. Ignorance, tyranny and fanaticism are its foes. Liberty, equality, and fraternity are its watch words. If we listen attentively and observe carefully we will discover something elevating and inspiring in the conferral of the degrees of Masonry, something that will enrich our lives. To grasp the great lessons of Masonry, we should always approach the source of learning in a spirit of humility and reverence. What the Ritual said to us when we were initiated in Masonry, it continues to say, and there is always the likelihood that we will receive that which may have escaped our heart and mind in previous conferrals. The entire pattern of Masonry, which encompasses virtually every philosophic and moral teaching, is not a thing separated from life. It directs us to the realization of life. Every step in the Ritual has its counterpart in the world about us. The Ritual of Masonry speaks to the individual. It reaches out for the best in man. It tells us that all learning must be used in the service of God and man. It points out that the seeker of truth must be properly prepared. In many ways the Ritual of Masonry tells us that character is the very substance of being. Without it man has nothing. With it he has that which is immortal. But why are these teachings communicated through Ritual rather than a lecture or some other means? Ritual is the oldest, and one of the most effective means of teaching known. The pattern and flow of the ritualized response facilitates learning. Ritual is so fundamental to us that it is one of the few things "wired in" the brain at birth. Ritual in a sense opens a channel for learning and helps us grasp not only the surface meanings but the deeper meanings of the lessons we see. Let us study the degrees of Masonry with the consciousness that as we learn the Ritual we learn how to live. Because symbols and allegory form such an important part of the Scottish Rite, a few works of review may be helpful. General Semanticists (scientists concerned with the ways in which meanings are transmitted) divide behavior into signals, signs and symbols. A signal is a communication so basic that it appears to be "wired in" the structure of the brain rather than being learned. Most animal communication takes that form, whether it is the mating dance of a peacock or the danger signal of the white-tail deer. Very little human behavior is signal, since very little human behavior is instinctive. Stopping when someone we are approaching holds out an arm toward us, with the palm of the hand facing us, may be an example. Sign behavior is learned rather than instinctive, but once learned it does not require thought, and we react appropriately without conscious thinking. Examples would be a stop sign, a flashing red light, the sound of a siren, or skull and crossbones on a bottle of liquid. Symbols, on the other hand, work ONLY if we consciously think about them, and they "work better" (become richer and more meaningful) the more we think about them. Usually, a symbol is only very generally related to the thoughts it invokes. There is nothing about a triangle, for example, which inherently suggests God. It is only when the intellect operates upon the symbol, considers that its three equal sides might relate to a Being Who is Three in One, and explores what that might mean or suggest, that the Triangle equates with Divinity. The Scottish Rite, as is true of all Masonry, makes heavy use of symbols. As we are frequently warned, "the symbol conceals, it does not reveal." Masonry dates from the time when "thought control" was common in society. Certain ideas were forbidden, and it was damnation to think them and a rather messy death to utter them aloud. And so, many of the ideas were encoded in symbols, rich in meaning to those who understood-silly or meaningless to those who did not. The early Christians use of fish as a symbol is a classic example of communicating by drawing that which it was unwise to communicate more directly. The symbols of the Scottish Rite do not easily yield their meanings and there may be many meanings to any symbol. Only after thought and reflection do they fulfill their function and begin to trigger ideas in the mind. 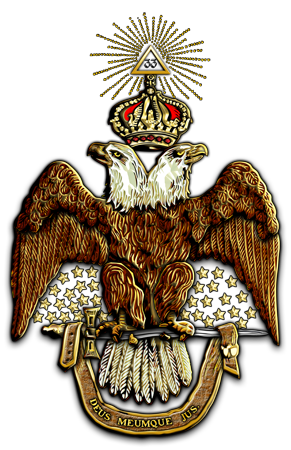 To illustrate this point, let us consider one of the most familiar of all Scottish Rite symbols, the double-headed eagle. The double-headed eagle was probably first accepted by Freemasonry as a symbol in the year 1758. In that year the body called Council of Emperors of the East and West was established in Paris. The double-headed eagle was adopted to symbolize the double jurisdiction of the Council-one which looked both to the East and to the West. The symbol is an ancient one, however, and not Masonic in its origins. The earliest appearance so far discovered was in the ancient kingdom of Lagash in the Middle-East long before the rise of Babylon. There it was known as the "storm bird" and was the special symbol of the kings of Lagash. It is later to be found among the rock carvings in an ancient Hittite cemetery. Over the centuries, the double-headed eagle has been used as a symbol by many nations. In general, its symbolic meaning in the Scottish Rite is that of duality contained in or resolving itself in unity. Thus, among many other things, it reminds us that man, while only one being, is composed of both body and spirit, that he is both temporary and eternal; that both good and evil exist in the world and that we must ever foster good while opposing evil. It reminds us also that knowledge comes both from study and from insight; that we have obligations both to ourselves and to others, and that both faith and reason are necessary. So, in the Scottish Rite, as in earlier symbolism, it has many applications, but all center about the same idea. The present, which must learn from the past and look to the future. Man, who is both spiritual and animal. Eternity, which is the product of both life and death. That we have obligations both to ourselves and to others. That creation is the result of both imagination and power. Knowledge comes both from study and from sudden insight of inspiration. What could it suggest, these two heads on one body? Two as part of one thing. Duality as part of unity. Perhaps even two opposites as part of one thing. What things have that double nature? Well, the Scottish Rite draws its teaching from both the Mysteries of the East and those of the West. We are told that man is both beast and soul, both animal and spiritual. Any object is defined in space by light and shadow that's another example of two opposites defining or giving form to one thing. And then, why an eagle-why not a cat or bull or a mouse? What do I know about eagles? Well, they are symbols of freedom. They are royal birds-only the king can hunt with an eagle. They fly high; the ancients believed they carried the souls of the dead to heaven. They are famous for their keen sight and powerful wings. They look down on the world and see it clearly, but rise above it. With thought, the symbols become a richer and richer source of ideas and insights. Finally, we should briefly consider allegory. Allegory might be thought of as symbols in words. It is a story told to make a point. Always the "real" story is something other than appears on the surface. These are old in the human experience, so old we cannot find a culture without them. Many children's stories are allegories. Indeed, any story that has a moral is probably an allegory. We treasure them so much that the fables or allegories of the ancient Greek slave, Aesop, have come down to us. The story of Hiram, the building of Solomon's Temple, and the rebuilding of the Temple are primary and important allegories in Masonry. It's important to remember that they are allegories, and not intended as history, lest one miss the point. The child who assumes that the story of Little Red Riding Hood has nothing to teach him or her because the child's grandmother lives in a condo in Florida and not a cottage in the woods, or who believe that Goldilocks is nothing more than a treatise on the feeding habits of bears has lost an important chance to learn.